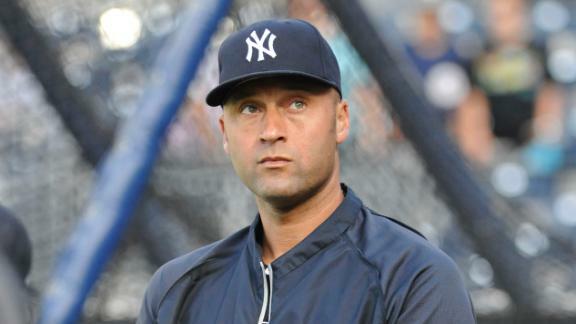 So not only are the New York Yankees getting their asses handed to them by the Red Sox this weekend, but now it looks like the ‘Captain’ Derek Jeter may have re-injured his surgically repaired ankle. Ken Rosenthal of Fox Sports is reporting that the reason Jeter left the Yankees vs. Red Sox game was due to an apparent injury in the area of the ankle he broke in last season playoffs. Replays show Jeter wincing as he attempted to make a throw to 1st from deep in the hole at shortstop. Back in spring training Jeter was shutdown as he suffered a setback in returning from the initial surgery. Another injury to that ankle and it may force him and the Yankees to think about moving from shortstop. I know, I know that’s blasphemy but shortstop is too demanding of a position if Jeter cannot stay healthy. Let’s not forget the strained calf the ‘Captain’ had, injuries to the legs for a shortstop is not a good thing. What about a move to 3rd base, I mean there is a certain player over there who could be suspended for a VERY long time (Alex Rodriguez). Or what about 2nd base, there is a player over there now who may sign somewhere else for big money (Robinson Cano). Oh well, bottom line Jeter is old and the Yankees have a whole a lot of issues and not much upside! By the way, how many more years on Jeter’s contract??? Update – CT Scan on Jeter’s ankle is negative, Yankees will send his results to Dr. Robert Anderson who performed the surgery on his ankle!